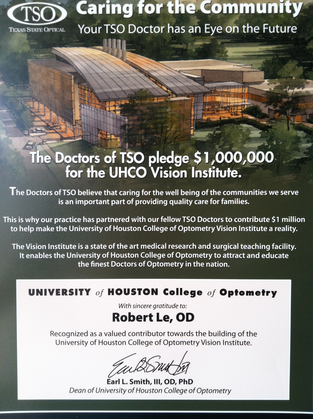 At Sugar Land TSO, we believe strongly in giving back to the community and caring for the eyes of all those in need. Outreach programs represent an opportunity to show the community the level of commitment our optometrists have to their community. The staff also plays an important role in community outreach. All of our offices participate in the Luxottica Vision's One Sight as well as other charitable services. When you purchase a complete pair of glasses, Dr. 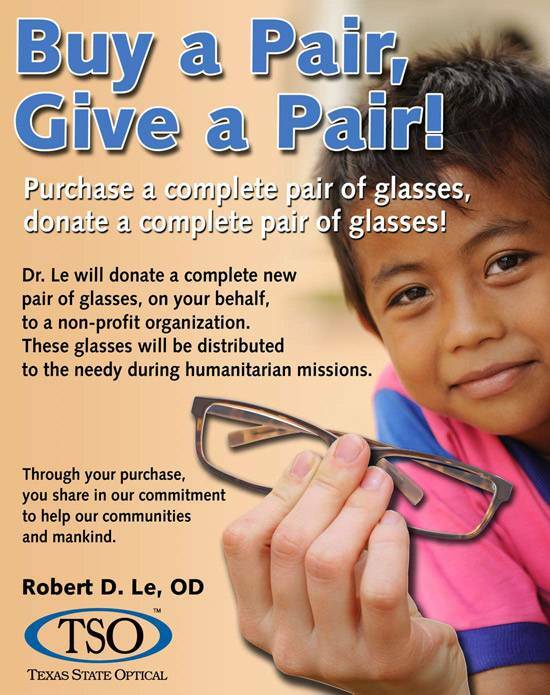 Le will donate, on your behalf, a complete new pair of glasses to a non-profit organization of your choice. These organizations will then collect the eyewear and distribute them to the needy during their humanitarian missions. We accept outside Rx for this program as well. During the month of September every year, Dr. Le honors the dedication and sacrifice of police officers and fire fighters by extending a free eye exam. Simply make an appointment and provide identification.